Cilantro | Izzy have you eaten? One of the first things you request for lunch when you are home for a visit Izzy, is an omelette. You love it stuffed with spinach and cherry tomatoes, fresh cilantro (coriander) and onion. We both agree that the caramelized onion really makes it. The addition of chopped green chillis takes it to another level for me, but that’s me. 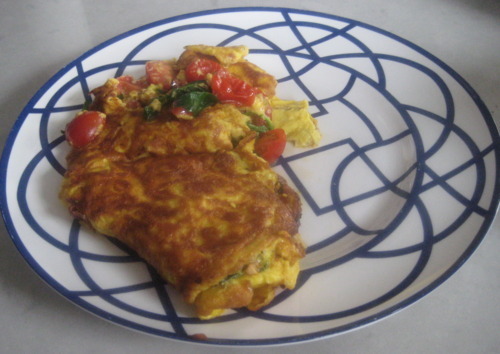 As this is your favourite omelette recipe, I will record it here exactly how you like it. But don’t forget you can do so much with the basic recipe: add bell peppers, and other fresh herbs. Flat leaf parsley, and oregano. Basil of course, and mint. You can turn it into a frittata and serve it with a green salad on the side for a satisfying meal to share. All you do it scatter the ingredients over the whole surface of the egg mixture, rather than on one half. Instead of flipping one side over to form an omelette ‘envelope’, you reduce the heat, cover with a lid and let it all cook through like a quiche or a pie. To make it hearty, you could add tiny brocolli or cauliflower florettes, or thin discs of potato. All variations produce some nice results. use the best eggs you can find. I use free range Rowe Farm, your equivalent in the Southern Hemisphere would be the crazy good Green Eggs. I know you love the cherry tomatoes as an ingredient, but the more juicy little fellers you use, the more watery the mixture becomes, and the egg and tomato juices separate. Not a pretty mess. one should really use a non-stick fry pan for best results with eggs. You’ll need a spatula or what’s called in America: an ‘egg flipper ’. when greasing your pan before cooking, make sure there is no excess oil left before pouring in the egg mixture. So, here, my dear is your original base recipe. With a fork, beat the eggs, add milk, and season to taste (1 teaspoon on salt is usually good). Mixture should be frothy. 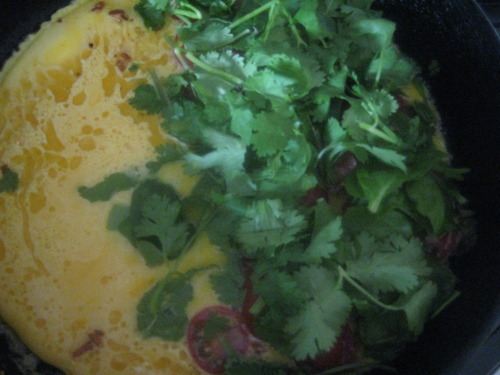 When the edges start to cook and become firm, scatter the tomato, spinach leaves, cilantro leaves and onion in one half of the egg mixture. Use the egg flipper to gently coax the edges away from the pan. When the liquid mixture is almost all gone, but still a little runny in the middle, gently flip the un-garnished side of the egg over to cover the other half. A little expertise over time will see you flipping the whole ‘envelope’ over to cook evenly on both sides. Don’t worry if it breaks a little in your first few attempts: it is all in the taste after all. Another two minutes or so, and you should be able to slide it off onto a waiting plate!